Cover: Shirin Neshat, Roja, 2016. Production Still. © Shirin Neshat. Courtesy of the artist and Gladstone Gallery, New York and Brussels. In our Interviews, Border Crossings looks at the politically charged work of Iranian artist Shirin Neshat and Dutch artist Lidwien van de Ven. Shirin Neshat’s work touches on the tradition of Iranian mysticism, where melancholy is elevated and beauty is paired with loss and suffering. Her work, though politically infused, opens to multiple interpretations, reaching toward universal conditions. Commissioned by Riccardo Muti to direct a new production of Verdi’s, Aida, Neshat’s re-reading of the work presents a contemporary/historical view. It is one that challenges our traditional concept of victim and victor. Ancient Egypt becomes a hybrid through her conception and allows us to look at that world from our current conflicted state. Aida will be performed at the Salzburg Festival this July and August. 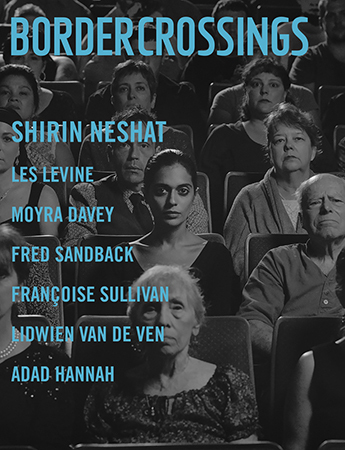 Additionally, Shirin Neshat has two exhibitions opening this summer. Dreamers runs from May 19 to June 17, 2017 at the Gladstone Gallery in New York and The Home of My Eyes, is presented at the Museo Correr in the Piazza San Marco from May 10 to October 31 as part of the 57th Venice Biennale. We also interview photographer Lidwien van de Ven, whose photographs are taut with political tension, although her lens is more than photojournalistic. “I go to places where I want to witness what is happening,” she states. “It is not about imposing my statement and my message, but to activate what is going on among the field of narratives, the image and the viewer.” Van de Ven captures the ambiguity inherent in complex cultural situations. Border Crossings interviews New York-based, Irish-born artist Les Levine, an early originator of media art. Border Crossings’ Crossovers include reviews on painter Eliza Griffiths, artists David Armstrong Six, Kai Althoff, photographers Josef Sudek, Thaddeus Holownia, as well as Cy Twombly, Wim Delvoye, and many more. Border Crossings is a quarterly cultural magazine published in Winnipeg, Canada. Its subject is contemporary Canadian and international art and culture, which the magazine investigates through articles, columns, reviews, profiles, interviews and portfolios. See more images, more exclusive content, and the latest news from Border Crossings on our website. Canadian student subscriptions available now for only 24 CAD per year! Sign up online!